Welcome to VintageSpartanAircraft.com. Beginning in 1926 and running through 1946, The Spartan Aircraft Company produced an interesting assortment of aircraft. These ranged in scope from the most basic two-place civilian flyers, to trainers for the military during World War II, to the ultra luxurious Spartan 7W that was designed as an executive transport. Most of us who are involved with aviation are dreamers. For warbird admirers, the dreams are probably about beauties like the P-38 Lightning or the P-51 Mustang. 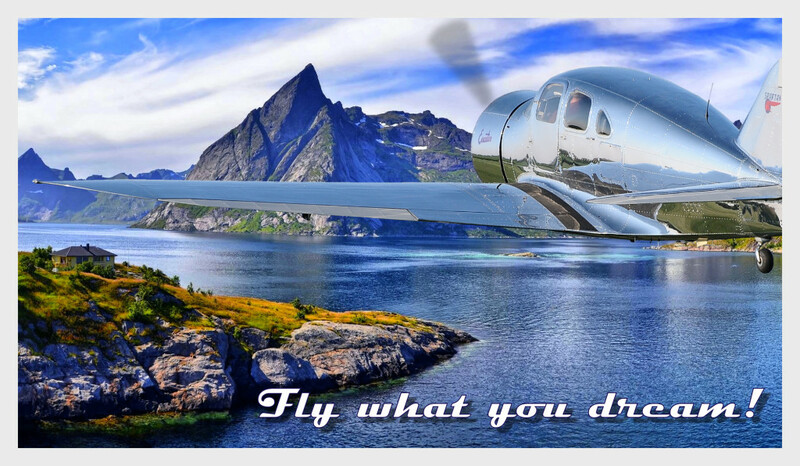 For fans of traditional vintage civilian aircraft, the dreams might be about Waco biplanes or Beech Staggerwings. For those of us who love shiny, art deco masterpieces, the dreams are likely to be about the classic Spartan 7W, more commonly referred to as the Spartan Executive. As the following picture indicates, my dream was to own and fly a Spartan Executive. In April 2008, the long process of realizing that dream commenced with the purchase of a non-flying Spartan Executive. There have been many peaks and valleys since that time, but as the following video shows, the end result really is a dream fulfilled. To put the content of this site in perspective, during a production run that began in late 1936 and ended in 1941, only 34 of these works of art were built. Although three-quarters of a century has passed, twenty have survived. This site will feature serial number 17, currently registered as NC17634. It will also include pictures and videos of other examples. Content will be added to this site as time permits and as new items become available. Feel free to make suggestions and check back often for updates.